Have you ever wondered why glacial ice is blue? Hundreds of people ask this question, among others, of the park rangers of Glacier Bay National Park. While any vessel is welcome to visit Glacier Bay, you’re probably like me and don’t have your own ocean worthy boat to coast through it. 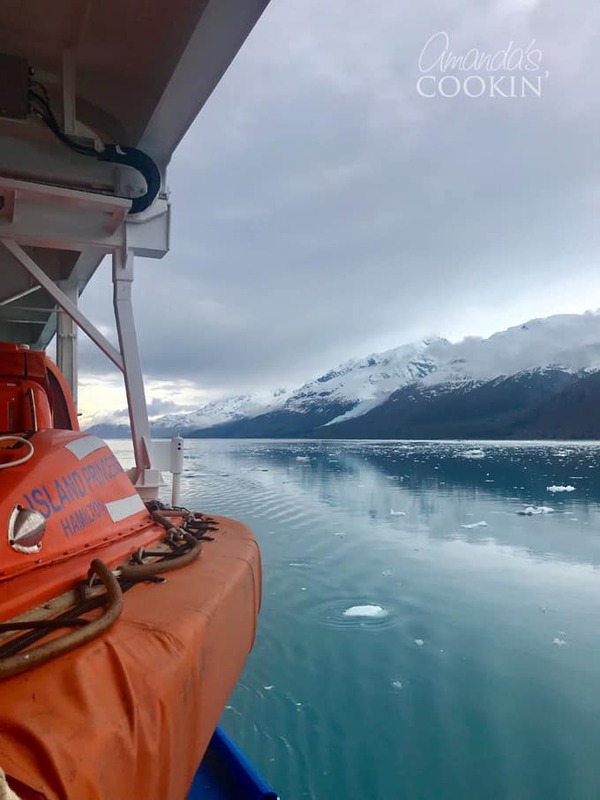 Going on a cruise through Glacier Bay in Alaska is the best way to experience the raw beauty of this magnificent national park! 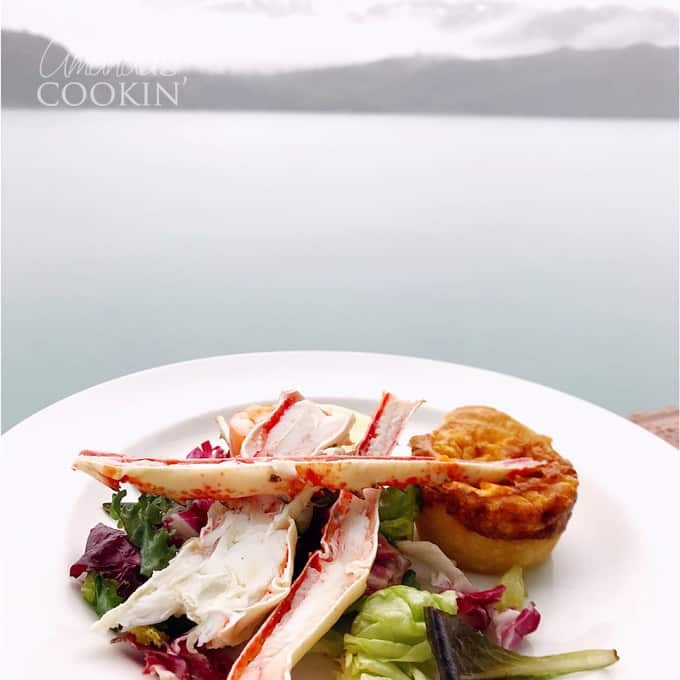 I had the distinct pleasure of partnering with Princess Cruises for my series of Alaskan cruise posts, a trip of a lifetime! In the late 1700’s the park was still an enormous sheet of ice. By 1879 the ice had receded enough to reveal some of the earth’s most magnificent wildernesses. From mountain peaks that reach as high as 15,000 feet to over 3.2 million acres of forest, inlet, and shore, Glacier Bay is truly a sight to see. 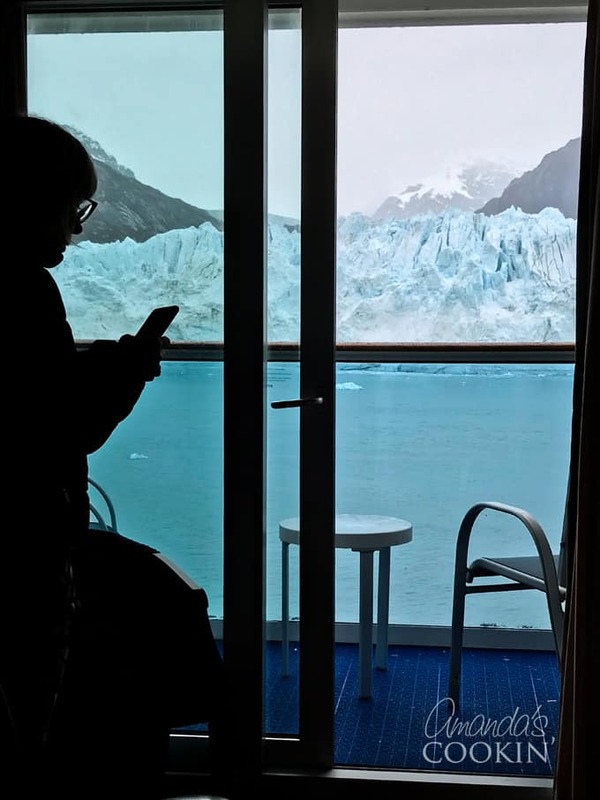 From the comfort of your stateroom balcony or on any of the ship’s decks, you get a front-row view of tidewater glaciers, including the Margerie Glacier, one of the most photographed features in the state of Alaska! We enjoyed the view with a magnificent room service breakfast on the balcony. What a great way to spend the morning. A glacier is literally a frozen river of ice that has formed from snow accumulating and compacting on mountains. A glacier stretches over and snakes between mountain ridges until they meet with the tidewater. That’s when calving happens. Calving is when large ice chunks release from the front of the glacier, falling into the water with the sound of a canon or thunderbolt. 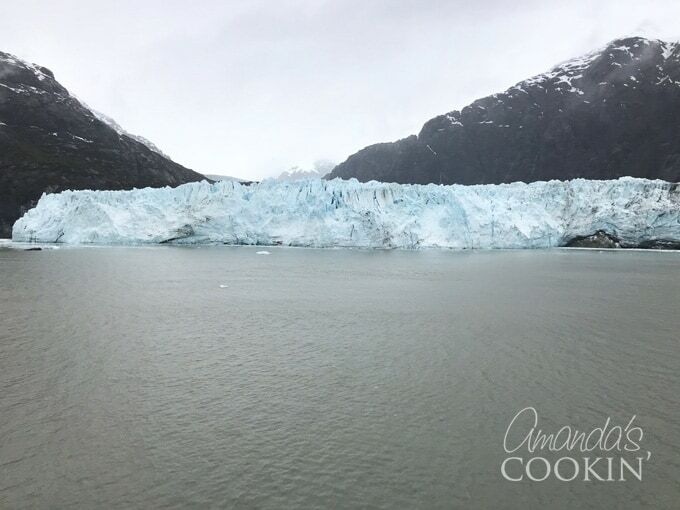 You can see the Margerie Glacier calving in the video below! Get outside! Whether it be on one of the multiple decks or on the balcony of your stateroom, you’ll marvel at the magnificence of these amazing glaciers. There’s nothing quite like the loud crack when a glacier calves and the sheer size of the ice wall is incredible! Stop by the onboard ranger station where you’ll find the latest itinerary of presentations. You can also speak directly with a park ranger and ask any questions you may have. 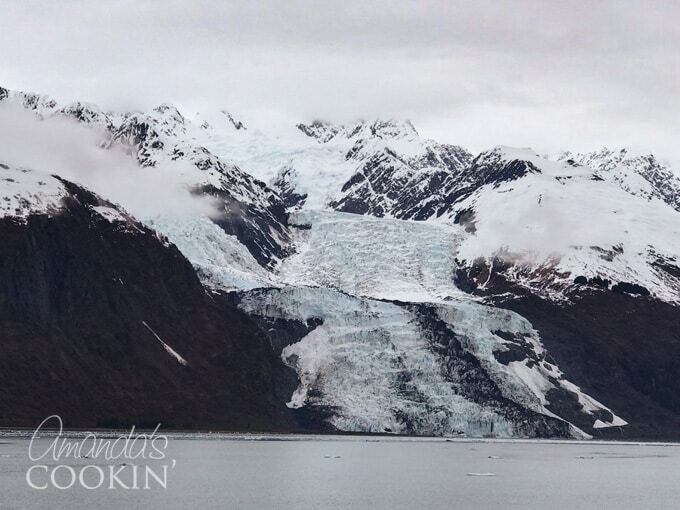 Peruse the Glacier Bay map that arrives outside your stateroom door. It’s filled with information on the plants, whales, animals and of course, tidewater glaciers in the bay. Check your stateroom TV for National Park Service videos. If you have children with you, they can join the Junior Ranger program, which comes complete with activity booklets in the youth center. Visit the ship’s library to find a large selection of books on Glacier Bay and Alaska. There are so many questions park rangers are asked that they’ve come up with a top 10 list! Chances are at least one in this list has crossed your mind before. Why is a glacier blue? Glacier ice is highly compacted from years of repeated snowfalls. Each new snowfall adds more weight to the top, compacting the snow and ice below it. When the light hits that compacted ice, long wavelength colors (reds) are absorbed, and short wavelength colors (blues) reflect back through the ice. This is what your eyes see! Anyone else remember this from high school science class? 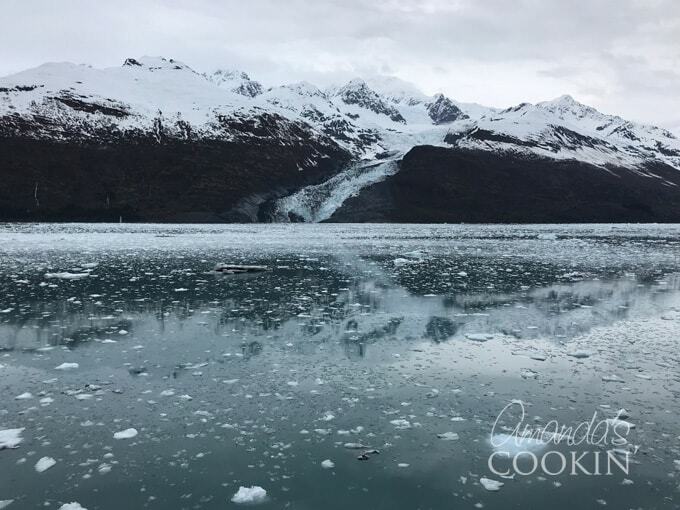 Does Glacier Bay water freeze over in the winter? The rangers say no! Due to moderate temperatures combined with wind and tidal fluctuations, the bay does not freeze over. What boats are allowed to enter the bay? Anyone, though the park does limit the number of vessels allowed in each day in order to protect park resources and of course, keep the traffic down. 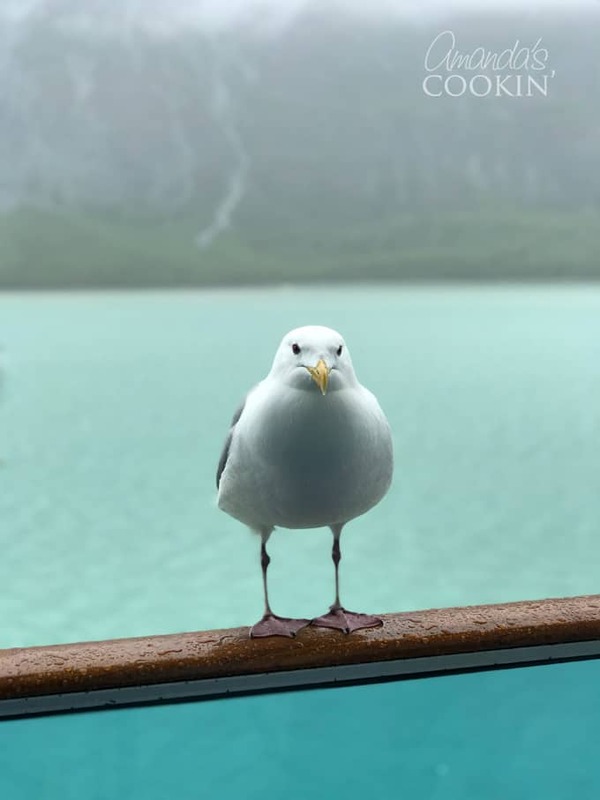 Two cruise ships are allowed to enter Glacier Bay each day. You might! Keep an eye out for humpback whales by looking for their spout expressions. You can see what those look like by checking out my whale watching excursion here. How tall is the Margerie Glacier? Remember when I said above that likely you’ve asked at least one of these questions? 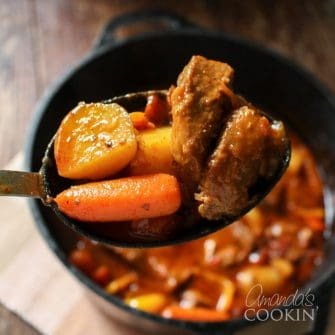 Well, this was one of ours! The glacier is about a mile wide and is roughly 250 feet tall above the waterline, with another 100 feet below the water! That’s a 25-story building above the waterline! Why do some glaciers look so dirty? Rock and dirt accumulate on the ice as a result of avalanches and rock slides. How deep is the water in Glacier Bay? Glacier Bay was actually carved out by a glacier and then filled in with salt water as the glacier receded. This created a fjord, which is a narrow and deep inlet of the sea between cliffs. Most of Glacier Bay is over 1,000 feet deep! Will I see a glacier calve? Chances are pretty good! According to park rangers, the glaciers in the bay can move over five feet each day! Tidewater glaciers usually calve a few times every hour. Glacier Bay gets a lot of rain, with May and June being the sunniest months. Alaska whether is quite unpredictable, so be prepared with layers! 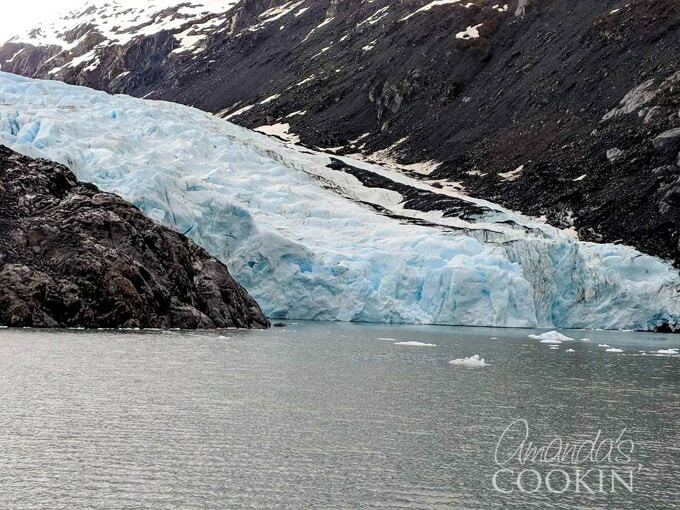 What about climate change, is it affecting Glacier Bay? Warming temperatures have definitely been documented in Alaska by scientists who study the climate. 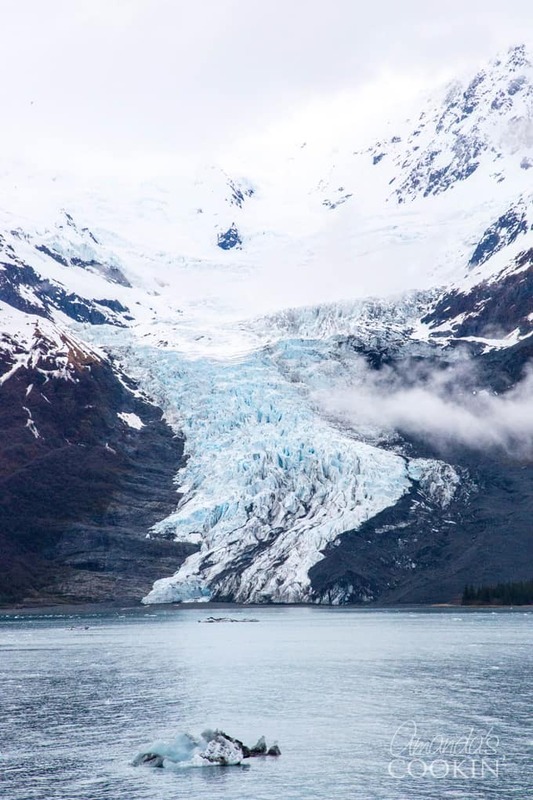 There are more than 100,000 glaciers in the state of Alaska and about 95% of them are thinning or retreating, including those glaciers in the bay. 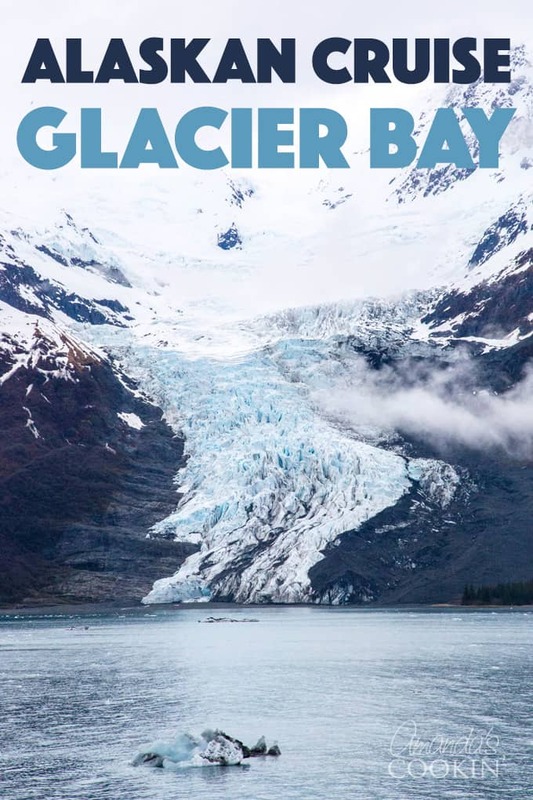 However, rangers have stated that due to heavy snowfall in the Fairweather Mountains, there are still several healthy and advancing glaciers in Glacier Bay. Common sense dictates, but don’t throw anything overboard! Make sure you don’t have any loose articles (clothing, etc) that might blow overboard. Don’t feed the birds or other wildlife. Please note that if you are eating your breakfast on the balcony, the seagulls WILL try to get some! In closing, just wanted to share this last photo. I took this picture on my balcony at 11:30 pm. Amazing how light out it still was! I hope you get a chance to go on an Alaskan cruise! If it’s not on your bucket list, add it right away. Oh my gosh!! Those views are stunning. Those glaciers. Makes me want to go to Alaska right now. It’s such a beautiful place. It was incredible to see the calving in person. Majestic is the only word I can come up with for it. 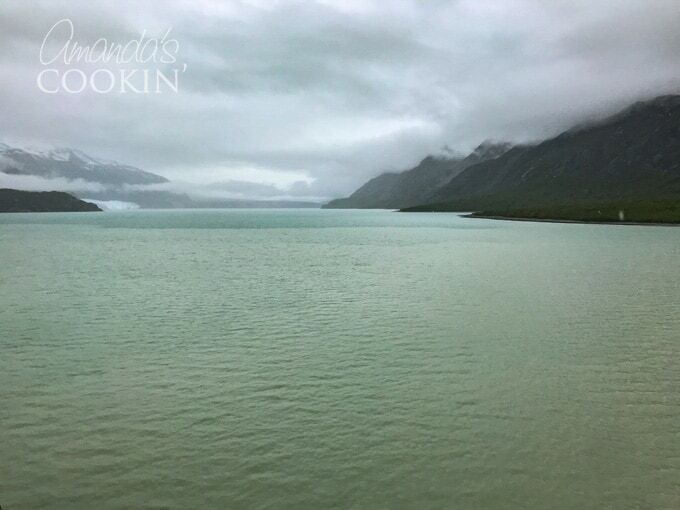 Glacier Bay is kind of a magical place – so pretty and so unique! Soooooo beautiful. this really makes me want to go to Alaska now! I took Princess’ Coral specifically because their itinerary went through Glacier Bay. Awesome trip and spectacular scenery. Wow, what an amazing experience. 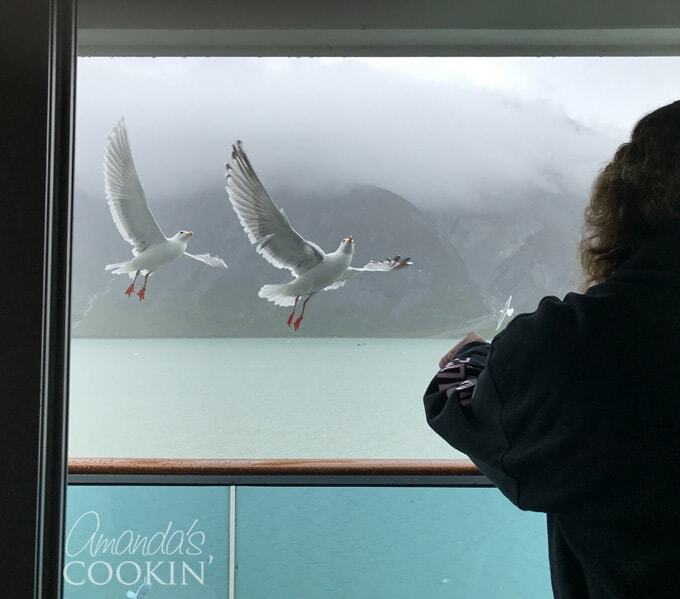 Your pictures of the trip are gorgeous but I particularly love the image of the birds in flight.